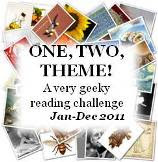 The Decades '08 challenge requires one book from each of 8 (at least!) consecutive decades. Here are my choices - I'm not completely sure about some of them, so I'll list my choice within the decades too!